What do your cows eat? | Sarah D.
What do your cows eat? 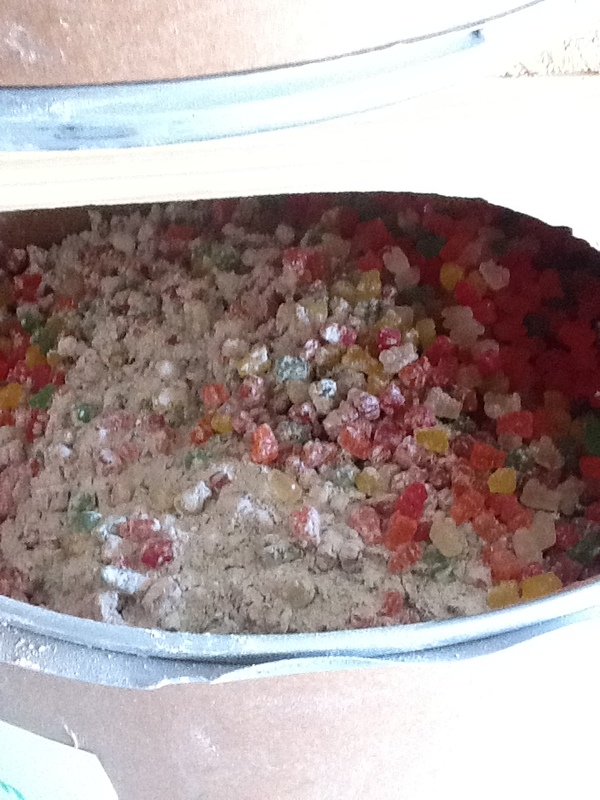 Here’s a picture of a starch/gummy bear mixture that comes from a candy factory. We feed this to milking cows at a dairy in Minnesota. The cow’s diet (we call it a ration or TMR short for total mixed ration) is formulated by entering all of our feeds into the computer and balancing for the nutritional requirements of a given group of cows or calves. There have been mountains of research over the years to determine what levels of nutrients are needed for milk production, gestation, health and growth of animals. It’s extremely important to me to know that I’ve provided everything that cow needs to remain healthy and productive because, unlike humans she can’t go out when she’s ‘craving’ something to eat. We watch so many details…when to feed, how much to feed, when to freshen up the feed the list goes on and on. We even do this thing called a TMR audit and run around the dairy with cameras and stopwatches making sure the feeder is doing everything he can to make the best feed – which seems crazy when I say it like that! Here’s a short list of the nutrients that I spend the most time stewing over when balancing a ration. Fiber – this one is first for a reason; a cow is a ruminant which means she has four stomach compartments and can digest large amounts of fiber. She has a specific requirement for fiber and if her diet is low she will have digestive upset and can get very sick. Protein – all animals require protein for function, muscle building and for lactating cows to produce milk. Energy – this is a tricky one for cows. There’s a limit to how much of different types of energy we can use or we upset her somewhat-delicate digestive system again. We use starch, sugar, digestible fiber and fat to meet her high demand for energy. The reason for the limitation is that inside the rumen, the largest of the stomach compartments, is a very large population of very tiny creatures. Bacteria and protozoa live in her rumen and essentially, I feed them and they in turn produce energy and protein for the cow. It’s a crazy symbiotic relationship that can be a little frustrating because if we feed too much fat or oil, the little bugs can die. Same thing with starch and sugar, we need to offer feeds in the right proportion to keep these friends happy. Lastly, we spend a lot of time getting the vitamins and minerals correct – balance and proportion is important here too. A dairy cattle nutritionist’s job is to keep the cows healthy and productive; we prevent illness and help to create contentness. It’s fulfilling, challenging, ever-changing and rewarding. From the time I was a little girl feeding hay in the winter, I’ve always loved to watch a cow eat! You should try it sometime – you might find you like it too. Great post! Welcome to the blogging world! Pingback: So what do cows eat anyways? « The Adventures of Dairy Carrie… I think I Need a Drink! Great job Sarah! My favorite part of watching cows eat when I was little was seeing them stick their tongues in their noses… a very cool trick that dogs also have a knack for. Keep up the good work! Looking forward to reading future posts! Pingback: What do cows eat? | The Adventures of Dairy Carrie... I think I Need a Drink! What do cows eat? |… on What do your cows eat? Robin on What do your cows eat? So what do cows eat… on What do your cows eat? dairycarrie on What do your cows eat?